Number two on our list of film retrospectives today is news from Jason Gray about the 1930's film of Yasujiro Shimazu visiting Berlin and Hong Kong in the next couple of months. The folks at Tokyo Filmex put together "Nippon Modern" a retrospective of films that exemplified Shochiku Studio's Kamata style, or films that focused on the everyday lives of modern Japanese, from the 1920's and 1930's for their 10th anniversary this past November. 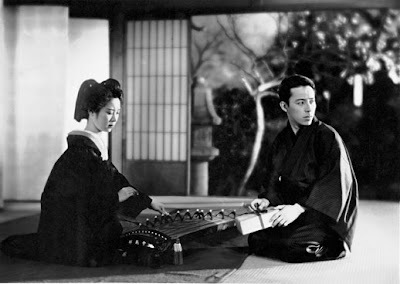 While the programmers at Filmex included films by such well known directors as Kenji Mizoguchi, Hiroshi Shimizu, Heinosuke Gosho, and, that other Yasujiro, Yasujiro Ozu the lion's share of the "Nippon Modern" line-up was made up of the work of Shimazu, a lesser known director from the first Golden Age of Japanese cinema, at least in the West. Now Filmex is hoping to introduce Shimazu's early 20th-century visions to international audiences when a half dozen of his films will screen at both the Berlin International Film Festival, running from February 11th to 21th, and the Hong Kong International Film Festival, running from March 21st to April 6th. Specifically these films are: "The Lights of Asakusa", "The Trio's Engagement", "So Goes My Love", "First Steps Ashore", "Our Neighbor Miss Yae / The Girl Next Door", and "Okoto and Sasuke" (above).